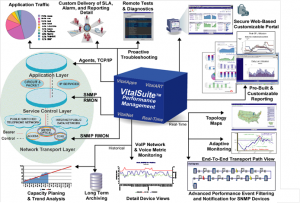 The VitalSuite Management Solution helps organizations optimize network performance by providing a comprehensive solution for monitoring the entire network infrastructure from a single, consistent, and easy-to-understand user interface. It delivers end-to-end, Web-based visibility into geographically dispersed, multi-vendor, and multi-technology converged infrastructures. The VitalSuite Management Solution provides both historical and near real-time views into everything from complex contact center transactions to mission-critical network resources. Its carrier-grade scalability provides support for millions of performance-monitored objects, allowing IT managers to monitor, analyze, and predict performance from a single centralized location. With VitalSuite Management, companies can more easily and effectively analyze the potential impact of new applications or services being added and plan more accurately for these changes. In addition to the core solution, three complementary modules complete the VitalSuite Management offering for enterprises: Real-Time Event Analysis for up-to-the-minute event correlation and advanced thresholding; Application Performance Management for ensuring an optimal end-user experience; and Advanced Reporting software for enabling customizable reporting for network planning and tuning to optimize network resources.